Martin Hopkinson queried whether the artist who painted the portrait of Joseph Proctor in the collection of St Catharine’s College, University of Cambridge, might be the same one who painted William Mortlock and others in Cambridge in the 1840s. The collection noted that J. Brooks might have been mistakenly written as G. Brooks, under which name the painting was then attributed. At the beginning of the discussion, Tim Williams suggested the possibility of both initials being right, evident in a J. G. Brooks, who exhibited a portrait at the Royal Academy in 1832. Searching in local Cambridge newspapers, Osmund Bullock was able to discover a John Brooks who moved to Cambridge with his family (from Birmingham) and is mentioned as a portrait and miniature painter. 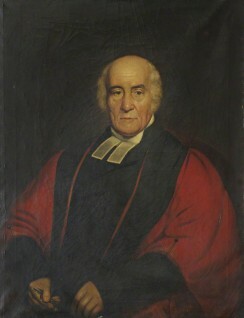 Bullock added that later newspaper articles provide information on both Mortlock and Proctor portraits, supporting Martin Hopkinson’s suggestion that John Brooks had painted Joseph Proctor. This theory was further advanced by Grant Waters (Art Detective Group Leader for South East England and East of England), who pointed out that John Brooks was the most likely artist, since both artists and sitter were resident in Cambridge in the early 1840s, therefore confirming the date the portrait was made. As such, the discussion concluded that the portrait should be attributed to John Brooks, with a date of ‘early 1840s’. Did J. Brooks paint Joseph Proctor (d.1845)? Can more be found about J. Brooks?